It's one of the easiest and tastiest classic Italian pasta preparations popular around the globe. We're going to make it today with very subtle changes in the original recipe. Fresh herbs and good cheese is the key to make a good pasta preparation. I prefer to make a slightly less cheesy version with toned down spice quotient which is preferred by my family members. You can definitely adjust the ingredients as per your needs. I've added boiled peas in this recipe which can be omitted altogether. Make extra servings of this one as it's without any doubt, lip-smacking good. So, let's get started and make this delicious pasta serving full of goodness and taste. For a vegan version, replace pancetta with tofu. Savor this lip-smacking and fulfilling penne carbonara recipe flavored with generous amount of cheese and pancetta which gives it a nice aroma and a good taste. Pressure cook green peas in salted water for about 10 minutes. Drain all the water and keep boiled peas aside. Whip grated Parmesan, cream and eggs in a bowl with ground black pepper and salt till everything forms a smooth and creamy base. Keep aside. Heat olive oil in a large nonstick pan. Add pancetta strips in it and stir fry for about 3 to 4 minutes on a low flame. Cook pasta in lightly salted water on a medium flame for about 6 minutes. Drain all the water and transfer hot pasta to the pan consisting of lightly fried pancetta strips. 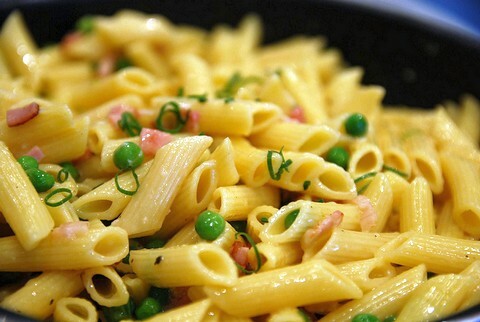 Add boiled green peas and toss pasta with pancetta strips on a low flame for a minute and switch off the flame. Immediately add whipped cream, cheese and egg base in the pan and mix it evenly to ensure it is applied well on the pasta. Garnish with chopped green onion leaves and serve hot.